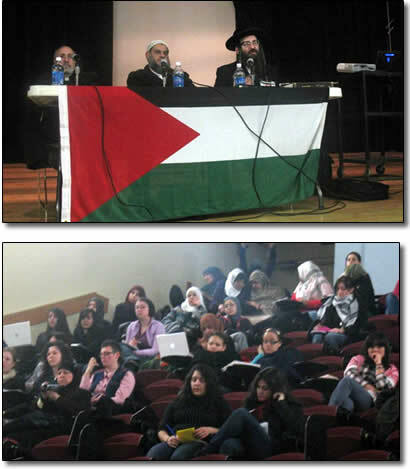 (Top)Rabbi Yisroel Weiss (right) of Neturei Karta spoke during a panel discussion in the City College of New York, on Thursday, February 26th, 2009, following the recent crisis in Gaza. Students attending the discussion panel listen with interest. Rabbi Dovid Weiss: Activist and the spokesman for Neturei Karta International: Orthodox Jews against Zionism. 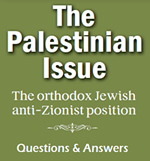 Weiss is against the philosophy of Zionism, and against the State of Israel and its actions. Father George Makhlouf: A Palestinian refugee, who lived under the occupation. A peace activist and a member of the Antiochian Orthodox Clergy of North America. Shiekh Mustafa Elazabawy: Imam of City Hall Masjid, vice president of Masjid Manhattan. He has been working with the community for two decades. Click the video below to hear his message.